Hi Charlotte! Good to see you, the kettle’s just boiled – what would you like to drink? Hello! Tea with one sugar and plenty of milk would be lovely please. 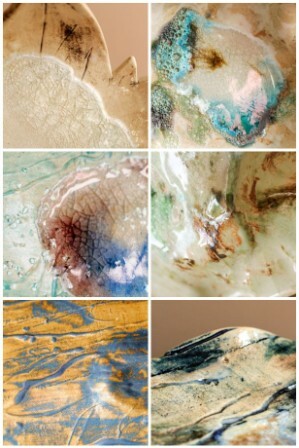 I’m a ceramic designer/maker based in the heart of Northamptonshire. 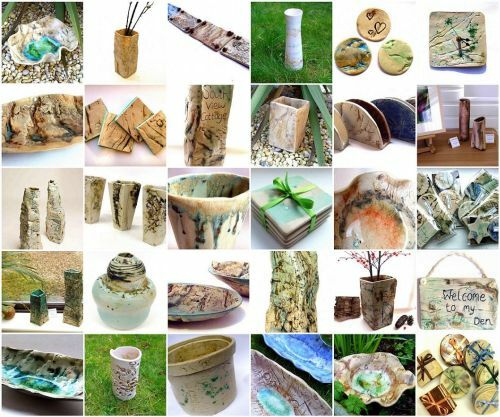 I make individual collections of items for the home and garden, many of which make ideal gifts for any occasion including vases, bowls, coasters, clocks, hanging decorations, sculptural vessels, ceramic art, plant markers and accessories. 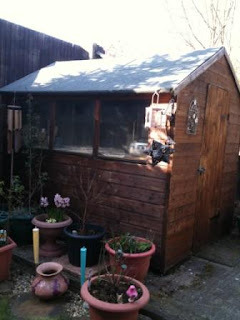 My workshop is based in my garden where I love to spend time making and thinking, with a cup of tea of course! My journey began when I found myself fascinated with the qualities of clay as a material while at college. I loved art and being creative at school. My college A Levels were like a foundation course, as I was able to get involved and experience every material to know which media I wanted to specialise in. I had always enjoyed surface pattern and design, which led me to go on to University in Coventry where I studied a 3 year BA Hons degree in Surface Decoration, and specialised in ceramics. I graduated in 2008 and have since been continuing to develop and broaden my work from my workshop at home. I am so proud of how far I have come during the past few years, and am so pleased with all of the amazing things that have happened. I can’t wait to find out what lies ahead of me in the future! 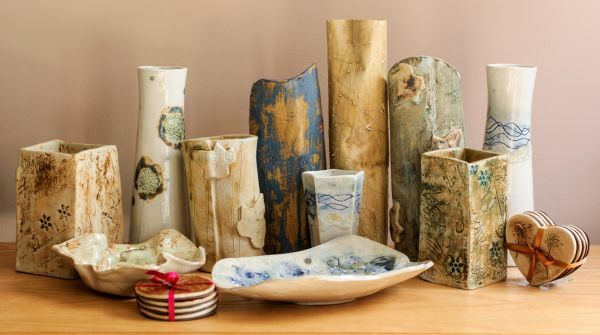 I started off sharing a kiln with another ceramicist a few years ago, but then I was offered a small kiln of my own through a friend of a friend. This was great for a while until the kiln became too small for my needs, and it was early this year that I had my new large kiln installed. It took a while to get there but it happened, I love my new kiln! The business wouldn’t exist without each and every one of my lovely customers. My customer base has grown significantly over the last few years. Things have certainly developed since my new website launch last year too. I would advise anyone with a business to start using social media for promotion if they don’t already, it’s amazing what you can come across! I’ve had many sales via Facebook and Twitter, and have also built up a wide range of like-minded friends and contacts such as gallery owners. I also took part in a competition on Twitter called #SBS (Small Business Sunday), ran by BBC Dragon Theo Paphitis. Never in a million years did I think he would ever retweet a link to my website, let alone get the chance to meet him! I also have a blog that I try to update regularly. Word of mouth has also been a strong promotional aspect; I have a lot of regular customers who like to tell their friends about my work. I think it’s the ‘unique, one-off’ element of my work that people find attractive, knowing they are the only person to own a particular piece. 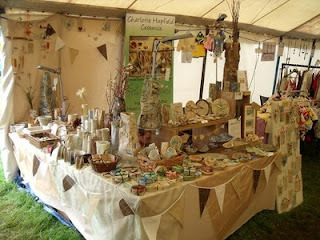 Attending craft fairs and taking part in exhibitions across the country is another way of promotion for me. I also think it is important that my website is kept up to date and looking fresh – so many people use the internet nowadays! The good thing about my workspace being fairly small is that I have no choice but to be organised! I usually have a general clean and tidy up after each working session, and plan what I’ll be doing ready for next time. I use the walls to pin up anything and everything, including inspirational images, design ideas, drawings, reminders, custom orders, and glaze samples. Being able to do what you love, and working towards your passion is the best feeling. Stepping outside into the garden and being at work is also great! Hearing positive comments from customers is always one of the best things. My workshop can get very cold during the winter months, and the cold can sometimes cause problems with the clay I use which is probably one of the worst things. 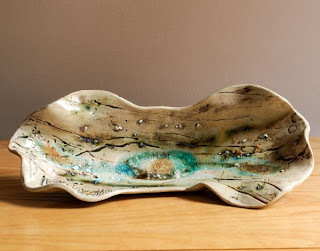 I’m a huge admirer of Kirsty Elson’s driftwood designs. She is very clever and makes the most stunning pieces including houses and boats from driftwood found on the beaches in Cornwall. The thing I love most about her work is that everything is made using recycled materials. If you have a passion for a particular 'dream' in life, don't stop until you reach that dream. Live your dream! My aim is to slowly be able to build up my stockists of shops and galleries, and to get my work more well-known. It’s such a confidence boost to have someone recognise my work. I would also like to take part in a large trade show such as the Country Living Fair - one day! Thanks so much for stopping by – it was so nice to be able to take the time to chat with you! Thank you for the chat, hope your viewers like my work! I don't see how anyone could fail to like your work Charlotte! It was interesting to hear you talk about social media, because it's worked so well for me too. It was fabulous to meet you at Theo's event, as well as the great man himself! I love Charlootes work. Thanks for the interview! Fantastic Feature. Charlottes pieces are absolutely gorgeous!!! Finally I got around to reading about your guest blogger! I always find these posts inspiring and wish I had done more in the way of a crafty education when I was younger. Good luck with your business Charlotte. I gave my sister in law one of Charlotte's pieces around 3 years ago and it's still pride of place on the coffee table. Beautiful work. Good to see you going strong Charlotte!